I have mixed feelings about athletes and PDF (public displays of faith). When a football star catches a touchdown pass and drops to a knee or points heavenward with his forefinger, at best it’s a statement of humility—a way of deflecting praise and adoration to the One who gave us our amazing bodies and athletic prowess to begin with. I get that. But an athlete’s PDF can also communicate something more theologically troubling: “God has blessed me—me personally—by enabling me to catch this touchdown pass.” If so, this raises the following questions: Is God a [fill-in-your-favorite-sports-team] fan? 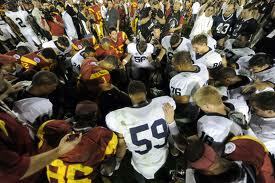 Why does God care who wins a football game? Is God playing favorites? After all, for every receiver who makes a catch, there’s a defender who failed to stop him from making a catch. Why didn’t God bless that guy? And if God caused the receiver’s catch, the defender couldn’t do anything about it anyway. Are we not free to use the gifts God gives us to play a game (for which I strongly believe we should be thankful) without divine intervention? I would happily offer Johnson pastoral counseling to talk him down from his theological ledge, but at least he’s being consistent: If God is responsible for all those potentially game-winning catches, then God is responsible for this game-losing drop. Right? Still, praying in anger to God is better than not praying at all. God can take it. And I suspect Johnson’s faith will recover. Do any of you know any celebrities or famous people? The closest I’ve come to knowing a celebrity is that when I was a kid, we had a family friend named Rick Rhoden who was a two-time All-Star pitcher in the Major Leagues. In the mid-’70s he pitched for the Los Angeles Dodgers. Back then, you may recall, for some weird reason, the Braves were in the National League West division with the Dodgers, so they played the Dodgers a lot. When the Dodgers would come to town, Rick would leave tickets for us at the old Atlanta-Fulton County Stadium will-call booth. Meyers is too young to know that “Thank You For Being a Friend” was a pop hit in 1978 by singer-songwriter Andrew Gold long before it was a TV theme song, but that’s not the point. The point is that there aren’t many songs (outside of the church hymnal, I mean) about being thankful. Many Protestant Christians, especially of a Lutheran or conservative Reformed persuasion, become deeply uncomfortable when talking about virtue—at least virtue as something that human beings foster or participate in. They don’t want to give human beings credit for doing anything that smacks of “works righteousness.” When it comes to sanctification—that spiritual transformation that takes place after we experience justification and new birth—the Holy Spirit does everything. It’s all grace. No one, not even the most hard-line Calvinist, behaves as if they believe this: Everyone knows that we tend to become more Christlike as we spend time in prayer, worship, Bible study, etc. And when it comes to performing these spiritual disciplines, our free will certainly seems to come into play. But if it’s our free will, then how is it also God? An extreme Reformed position (I’m not talking here about mainline Presbyterians) denies free will entirely. We may think it’s our will, they say, but it’s really God causing us to do these things. We don’t really choose. In N.T. Wright’s book on sanctification, After You Believe, he tackles this question head on throughout the book. Here’s an excerpt from a chapter on the “fruit of the Spirit” in Galatians 5:22-23. Thank you, Tom, as always, for saying something better than I can. It’s nice to know that my struggle to explain cooperating with God is the result of standing at the “borders of language.” I like that! † N.T. Wright, After You Believe (New York: HarperCollins, 2010), 197. This Sunday is the first Sunday in Advent, a season in which we prepare our hearts to celebrate the arrival of Jesus Christ at Christmas. This Sunday, we start at the beginning of the Christmas story in Luke’s gospel: Zechariah meeting an angel in the temple. Our scripture is Luke 1:5-23. Here’s a video about gratitude that we showed last Sunday in Vinebranch. Enjoy! 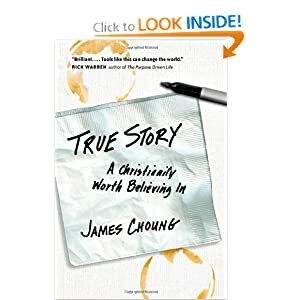 "True Story" will help many Christians better understand and articulate the Christian faith. A couple weeks ago, I preached on witnessing. One of the promises we make as members of the United Methodist Church is to serve Christ through our witness. This fifth part of our membership vow was only added a couple of years ago at General Conference—likely the result of justifiable concerns by the more evangelical wing of the church that we’ve placed too much weight on service as a means of witnessing. Of course we bear witness to the love of Christ when we love, serve, and do any work for God’s kingdom. In fact, our actions are the most important way in which we witness. At some point, however, we have to say in whose Name we do all this good work, right? You brought it to my attention, that everything was made in God. Is and was in the beginning and evermore shall ever be. Surely a part of what it means to live a life of gratitude is learning to see the God in whom we live and move and have our being in everything. Some people are better at that than I am. I’m working on it. A month ago, I, along with every other clergy person in the North Georgia Conference, had to take part in something called the “Bishop’s Day Apart” at the Simpsonwood retreat center. Bishop Watson plays host to these short retreats each year. The theme of this year’s gathering was clergy “self-care.” The United Methodist Church wants us clergy to take better care of ourselves—emotionally, physically, and spiritually. I’m sure this emphasis on self-care comes in the wake of published studies that show that clergy suffer obesity, hypertension, and depression at rates higher than the overall population. “Now that you’re here, be here.” I like that. Ancient wisdom from a large number of religious traditions teaches us to be present in the moment, not to be distracted but to focus on the task at hand. Jesus captures a sense of this in the Sermon on the Mount when he gives us these challenging words: “So do not worry about tomorrow, for tomorrow will bring worries of its own. Today’s trouble is enough for today” (Matthew 6:34).